A small, simple, reliable solution when you want to record a single VHF/UHF radio handset or telephone extension. This is a lightweight little black box and cable that comes preconfigured. It's ready to connect to your handset and start recording audio. Recordings can be searched and replayed from a simple web interface. The web interface can be accessed by a smartphone, tablet or laptop with a WiFi connection. 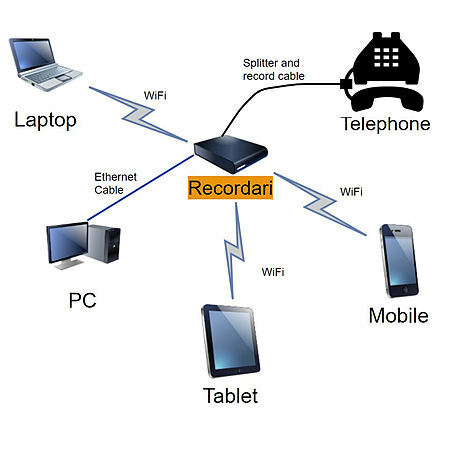 Recordings can also be retrieved with a PC or laptop via a network cable. Recordari is the ideal solution when you need to record a device in a remote location or just want a small recorder that you can tuck away in a confined space or out of site. The web interface can be configured to include your business logo and the system requires minimal maintenance. The Recordari system and its recordings are stored on a microSD card, just like you’d find in a smartphone or camera. This means future software updates can simply be performed by replacing the microSD card with a new one provided by CallTech. Give us a call if you’d like to know more.